DECENT Participating in the Largest Bitcoin AMA Event! One of DECENT’s founders Matej Michalko, is joining Q&A session held by Roger Ver. He is going to participate on the event to share interesting ideas and support the protest against discussions’ censorship on various platforms on the 27th of November. The event was already supported by many individuals from Crypto Community such as Andreas Antonopoulos, Gavin Andresen, David Johnston and many others who wanted to express their opinions freely and without manipulation. 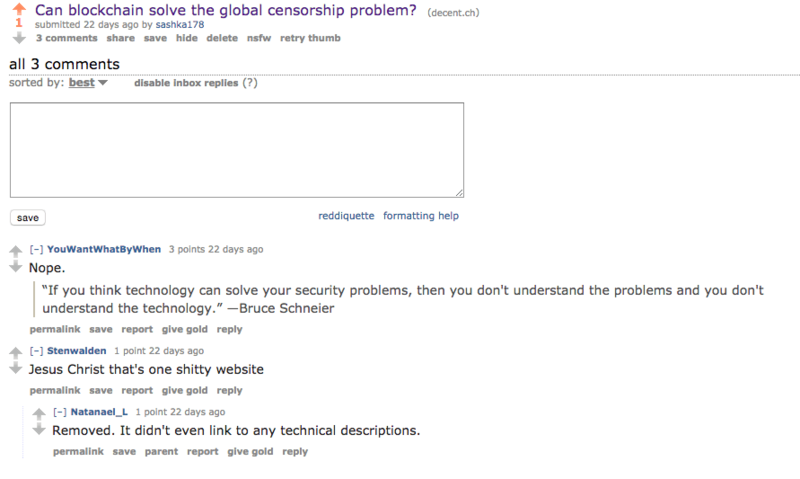 The censorship of online public discussions has become a big deal during the recent days as the biggest AMA session was allegedly censored in /r/bitcoin subreddit by manipulating the vote count. As the article on Cointelegraph describes, it is believed the event was censored due to the fact it is hosted on bitcoin.com after the disputes of R. Ver (the owner of the domain) with OKCoin (company in charge of development of bitcoin.com). DECENT platform has also noticed strange behaviour of moderators in /r/crypto subreddit from where our post was deleted without any obvious reason. Their explanation was based on missing technical description which was however not true. By visiting our web site, everyone can clearly see there is a link for downloading our whitepaper which includes detailed explanation of DECENT platform’s technical details. As Reddit or Bitcointalk.org were always considered to be the public forums and places for open discussion without any boundaries, we strongly disagree with such steps taken against the users. DECENT is dedicated to the principles of free speech. That is why we are creating the borderless content distribution platform and also why we have decided to support the cause and spread the word about the largest Bitcoin AMA event. DECENT’s founder Matej Michalko is ready to answer your questions this Friday – 27th of November at 3 PM GMT. For more information about his current and previous successes don’t forget to check his profile on forum.bitcoin.com.